Actually, this is not one of my favourite dishes because I am not too partial over turnips. 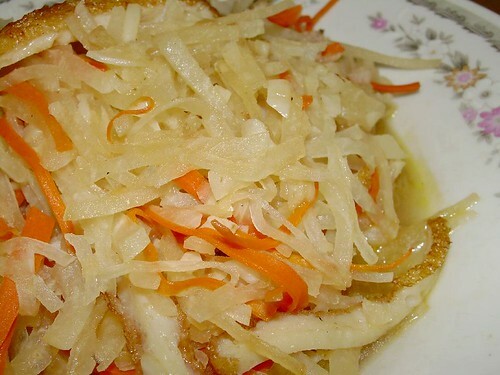 But it is quite frequently cooked by mum 🙂 and I remembered I used to have Stir-Fried Turnip with Carrot and Dried Prawns often for lunch (with plain porridge) during school days. It is, however, a very simple recipe to cook and relatively cheap as well. You probably won’t need a whole turnip unless you are cooking for a few people in one go. The dish tastes a blend of sweetish and salty with a hint of dried prawns which can be fragrant to some but offensive to those who are unaccustomed to this ingredient. You can actually use dried cuttlefish strips in replacement of or in addition to the dried prawns. Heat oil in wok and saute dried prawns and garlic together till fragrant or till garlic begin to brown. Add fish cake slices at this point (optional). Add turnips and carrots and stir fry briskly for about 30 seconds whilst adding salt and pepper to taste. Sprinkle water (used to soak dried prawns) to keep turnips and carrots moist. Cook the turnips and carrots to your desired softness and serve hot. easy to make and joyfully delicious..
man.. you’re makin’ me hungry..
oh.. lunch hour.. no wonder.. This is the “liao” (without the fish cake slices) for making popiah! I love this! I can eat a whole plate by itself. My mom will add some minced meat to this dish. Remember we belong to the the Pork Lovers Association. Popiah filling!!! I’ve never eat this dish as-is. It’s always in the popiah! I know lots of work taken to grate the turnips. simcooks & tigerfish : Har? This is popiah filling kah? Not in my family though. Our popiah filling is very “full of ingredients” wan. I need to jot down the recipe from my mum before I post it up. Can faint wan when you read the list of ingredients and work involved. this is popiah liao. i look at the photo, i thought you going to make popiah. hehe..
the turnip ‘mix’ is the major part of the popiah, still got shredded eggs, chinese sausages slices, crush peanuts mix, tauge, veg and sweet sauce. hmmmmm thinking of eating one right now! i actually thought it looked like juu hoo char actually albeit a lighter version.